All Souls' Day is a day set apart for honoring all who have died. The other names you might hear for this special day are "The Feast of All Souls" or "The Commemoration of All the Faithful Departed." It is celebrated on November 2nd, and unlike All Saints Day, which is celebrated one day prior, All Souls is not a Holy Day of Obligation. While the two feasts are somewhat related, they do, in fact, have their differences. All Souls' Day remembers the souls of all who have died, including those who may not yet be in Heaven, while All Saints' Day commemorates those who have died and are now seeing God face-to -face - whether they be capital-S Saints or lowercase-S saints. All Souls' Day is a day to remember the souls of all who have died, but especially those who have not yet attained Heaven. Having a feast such as this may sound dismal or morbid, but it should not be. This feast should serve as a valuable reminder of what we are made for and what our ultimate goal is - to have eternal life with God in Heaven. It should also be a special day to fondly remember loved ones who are no longer with us. Catholics believe that a deceased person can go to one of three places - Heaven, Hell, or Purgatory. Many innocent persons who suffer from disease, poverty, or persecution are living their Purgatory now, and when they die, the Church believes they probably go straight to heaven. Similarly, people who live an exceptionally holy life bypass Purgatory and go directly into heaven when they pass, according to our beliefs. The Church believes that most everyone else, although not bad enough to go to Hell when they die, won't simply skate into Heaven without first some self-examination and cleansing in Purgatory. Catholics don't see Purgatory as a place of pain and anguish. Instead, it's considered a place of expectant joy, and that eventually getting into Heaven and seeing God will be worth the wait. Purgatory is a place for those who are free of mortal sin and are eventually Heaven-bound but are in need of further purification before entering Heaven. Once the time of being cleansed of their venial sins is over, the souls in Purgatory are then admitted into the perfection of Heaven. An overly-simplified way to explain this is to pretend Jesus has knocked on your front door because He wants to meet you. But you just came in the back door after doing yardwork, and your hands and clothes are dirty, your hair is a mess, and your body is sweaty. You'd probably want to first take a shower and change into clean clothes before you met the Lord of Lords, the King of Kings! Only if you felt well prepared and cleansed would you then feel more comfortable meeting Jesus. Purgatory is that time of taking the shower and changing into clean clothes, making final preparations before this special event of meeting the Almighty. We should pray for the souls in Purgatory often because with our prayers it is possible to lessen their time in Purgatory. The souls in Purgatory are still members of the Church. They have completed their earthly journey but they aren't in Heaven yet. Of course, the most powerful prayer of all when praying for the departed is offering the Holy Sacrifice of the Mass for the souls in Purgatory and for t he souls of all who have died. Going to Mass should be an essential part of All Souls' Day because of its importance and great power. That is why we're having an all-school Mass on November 2. Parents are encouraged to attend next Friday's 9AM All Souls Day Mass with your grade K-8 children. Furthermore, it would be fitting to also go to Mass as a family the day prior, November 1, as All Saints Day is indeed a holy day of obligation. St. Louise Parish will have Masses at 9AM and 7PM next Thursday. Finally, I look forward to seeing your kids' adorable costumes next Wednesday on Halloween! 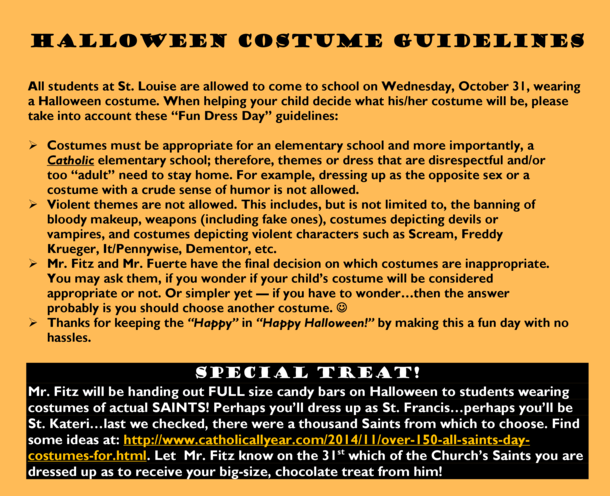 Remember, if any students come up to me and show me that they are dressed as a Saint, I'll have a full-size candy bar to hand them as their treat. Who knows!? Perhaps you'll see Mr. Fuerte and me dressed up as Saints, too! Because we have no school next Thursday the 1st, I'm going to send out the Parent Bulletin the morning of Friday, November 2. Also next Friday, expect your youngest child to come home with Confirmation of Conference Time letters from all your children's teachers. You're asked to confirm the scheduled parent/teacher conference date and time will indeed work for you. This Saturday, October 27, from 8AM-12PM, parents are invited to join our Fall Fix-Up and help beautify the school and parish grounds. We'll be raking leaves, pulling weeds, and doing other yardwork as directed by our head volunteer landscaper, Jeffrey Hummer. Please email Jeffrey if you are attending, so he knows how large the work force will be. At the end of the morning, Mr. Fitz will feed all the workers lunch in appreciation. Please meet outside the north wing of the original school with your work gloves, yard tools, and a wheelbarrow (if you're able to bring one). Thanks for considering helping out! We need a few more volunteers to step forward and help supervise our 11:45-1:00 lunch recesses on a weekly or every-other-week basis. It's important to keep your children safe and supervised when they're outside playing, and our paid supervisors need additional volunteer help on select days. You don't need to know the rules for soccer or to demonstrate an ability to climb the BigToy in order to be a recess supervisor. You just need to like the outdoors and like kids. Training is provided. If you can help one 75-minute day on a weekly or every-other-week basis, please email our head supervisor, Lisa McKenna. We are just 17 days out from It's a Wonderful Life at St. Louise! Wow - all the preparation and planning is really coming together now! With the incredible support of our new School Sponsors, our tuition raffle ticket and glassybaby sales, and the registrants from the Deck Party, we are officially 100% underwritten! Here's what that means... there's a cost to putting on an event like this, so we try to get everything paid for before the auction so that all the dollars we raise at the event come back to us - and we did it! Miss Helfen's 1st grade class enjoyed their Krispy Kreme donut party yesterday. They brought in the most bottles of Premium Wine for all of our auction wine needs! Thank you so much to everyone who brought in wine! 1. Register NOW to attend the big event! We want to see you there! Be sure to tell us who you want to sit with in the Special Accommodations field. 2. Parties are LIVE NOW! Don't miss out on the fun! Sign up for one of the amazing parties you'll see in today's Red Envelope. Worried you won't get a spot at the party of the year? Click here to see the Parties Registration Page. 3. Volunteer for Set Up & Clean up on Auction Day! Click here to support Item Display, Load In/Load Out and Distribution. Please take a look at today's Red Envelope for more information about the Auction. Cannot wait to see you at the Seattle Marriott Bellevue! Thanks to your completion of the Parent Survey, teachers have noted your preferred days and times for upcoming Thanksgiving-week parent/teacher conferences and are currently working together to schedule the best times, making sure to create back-to-back times for parents with two or more students. Next Friday, November 2, teachers will send home a Confirmation of Conference Time letter, noting your scheduled conference day and time. You will be asked to sign the bottom section of the letter to confirm the time, and return it to the teacher the following Monday. Flu Season is around the corner. Are you and your family "flu" ready? Influenza (also known as the flu) is a contagious respiratory illness caused by the flu virus. Anyone can get sick from the flu and spread it to friends-even if you consider yourself to be healthy. Getting the flu vaccine is the single best way to protect yourself and your family from this serious disease. This year the FluMist (nasal spray) will be available but the American Academy of Pediatrics is advising the standard flu shot because the FluMist has been shown to be less effective. The CDC recommends anyone 6 months or older to get the flu shot. Please remember our school policy is that a child may not return to school after being sick unless his/her temperature has returned to normal (without the use of Tylenol/medication) and he/she hasn't vomited or had diarrhea for at least 24 hours. That would mean your child was "back to normal" by no later than 8:30AM the day prior - not simply the night before. Thanks for helping to not spread illness throughout the school! St. Louise Parish School is hosting our annual St. Nicholas Breakfast and Christmas Bazaar on Saturday, December 1st. We're inviting local artists to showcase their arts and crafts. Proceeds from the Breakfast and Bazaar benefit the St. Louise Parents' Club and student enrichment programs. Kindly email Janelle and JT Taasan, our St. Nicholas volunteer coordinators, at stnick@stlouiseschool.org if you are interested and would like to receive additional information. Please extend the invitation to any other craft creators you feel may want to participate. Thank you for helping make our event a wonderful Advent/Pre-Christmas experience for the larger St. Louise community. We're stocking up on special bonus rebate offers and special holiday season cards to help you get ready for holiday celebrations. Special offerings of $5, $10, and $15 cards are available for a variety of popular stores and restaurants, so please stop by the Charger Card window or visit www.shopwithscrip.com to learn more. NOTE: Before you purchase all the treats for Halloween, please get your Charger Cards! Earn big rebates during 7 days of flash bonuses - Bonus Fest is coming October 24th through 30th! Each day features a different lineup of brands for 24 hours only. Participating brands will be announced at 9PM Pacific Time each day the night before. All products for the brands will be on bonus. Families have to order online to earn big. Visit www.shopwithscrip.com to learn more. Next Friday's window sales will not be affected by NO SCHOOL on Thursday, November 1. However orders placed during next week will be filled and sent home on Friday th 2nd and not next Thursday. If you place your order before 9:30 am this Monday morning, then your order will be part of our Purchase order and will be filled next Friday. Of course, you may always purchase 24/7 at www.shopwithscrip.com or myscripwallet.com for ScripNow, Reload, or Reload Now cards. It is basketball sign-up time! Please register your 4th through 8th grade children to be a part of St. Louise CYO Basketball for the 2018-2019 season. St. Louise CYO Basketball is open to all 4th through 8th grade students at St. Louise school, as well as to children who attend other schools but whose parents are members of St. Louise Parish. CYO Basketball is for kids of all skill levels - from beginners to experienced. Every child on a St. Louise team will get guaranteed playing time. All registration is done online at: https://reg.sportspilot.com/106300/leagues. $45 for the third child registered within the same family. These regular Registration Fees are in affect until Friday, November 2, at 11:59 pm. Late registration between November 3-16, will see the fees increase to $110. By the way, all regular season CYO basketball games are held on weekends, either Saturday or Sunday. Teams typically play 7 or 8 regular season games. The opening weekend for games is November 17-18, and the regular season ends on January 27. There are no games scheduled over Thanksgiving and Christmas weekends. If you have any questions, please contact me - St. Louise Basketball Coordinator, Rodney Thomas - at rodneytthomas@hotmail.com . Thank you in advance for signing your child/children up for Chargers Basketball! Do you sense that something's missing in your life? Do you feel that if you weren't so busy you would be happier, healthier, more effective, more fulfilled, and maybe even a better person? All men from St. Louise School and/or Parish are invited to the next Christ Renews His Parish (or CRHP) weekend! This Men's Retreat is an incredible experience. Whether you want to connect with other women/men in the parish, improve your prayer life, or just take a break from the craziness of your everyday, you will find what you are looking for-and more. The weekend is a one-and-a-half-day retreat designed to meet you where you are in your faith journey. It is hosted by fellow parishioners who have previously attended a CRHP retreat at St. Louise Parish and want to pay it forward. Questions: CRHP@stlouise.org or Paul Davie at 425-802-3151. Attendance is limited to 36 participants due to space availability, so sign up soon! "We must empty Purgatory with our prayers." All parents are welcome every Wednesday-schoolday at 8:15 a.m. to pray with fellow school parents in a small-group setting. Please check in at the school office.